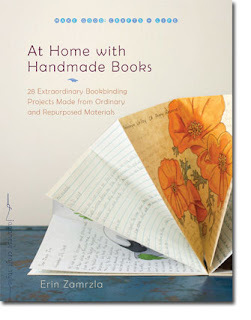 The subtitle of Erin Zamrzla's new book, At Home with Handmade Books, is a very appropriate summary of its contents: 28 Extraordinary Bookbinding Project Made from Ordinary and Repurposed Materials. I immediately fell in love with the clean and simple design of the book itself, which included amazing photographs of the projects included in the book. There is also a clean and simple quality to the ingenious creations of the book...with a range from adorably cute to stunningly beautiful. The first six sections of the book, comprised of about 50 pages, focus on specific types of handmade books including accordion, flutter, four-hole binding (includes numerous variations), Yamoto binding, account, and ledger. Each section includes 2-8 examples. Some of my favorites included a "Read & Write Bookmark Book" and giving the covers of old hardcover children's books new life in creating a custom journal with a four-hole binding technique. And I won't even tell you the uber-creative ways in which she uses tube sock, sponges, seed packets and pillowcases to create one-of-a-kind books. You'll just have to get the book and find out for yourself! As a scrapbooker, I know that those of you that enjoy making mini books would just EAT UP some of the ideas and album concepts that Erin shares in this book. Even I, who does not venture into mini book creation very often, found numerous ideas that I can't wait to incorporate into my layouts. The Japanese bookbinding methods are so beautiful that they would add a whole new level of elegance to a layout not to mention that adapting some of these techniques would be a great way to include additional photos and or hidden journaling on standard layouts. After the sections highlighting the projects, Erin is sure to give the reader everything they need in order to recreate the beautiful projects and more for themselves. She starts with a section discussing all the basic tools and materials required or recommended for basic bookbinding. Then, she moves into bookbinding basics with a glossary of terms and step-by-step instructions in both word and corresponding illustrations of all the basic stitching techniques including Japanese four-hole, noble, hemp-leaf, tortoise-shell, improvised Japanese four-hole, Yamato, account book and ledger. Finally, the last section of the book includes step-by-step instructions (again in both word and corresponding illustrations) of each and every one of the 28 projects included at the beginning of the book. Zamrzla essentially takes techniques that might initially look complicated and makes one eager to give this elegant form of bookbinding a try! You can watch Erin completing one of the simpler projects in the following YouTube videos. If you'd like to see a little more for yourself, you can view a select number of pages of the book on the publisher's website here. I do have one copy of At Home with Handmade Books to give away to one lucky AMOM reader. All you have to do is leave a comment by 5 p.m. on Thursday, May 5th, 2011.